One of the toughest challenges for web designers is educating clients about the website development process. Over the years, I’ve found that most clients do not have a clear idea of how a web design project should progress. And this lack of understanding usually creates a lot of frustrations on both sides, resulting in avoidable discussions and confusion. 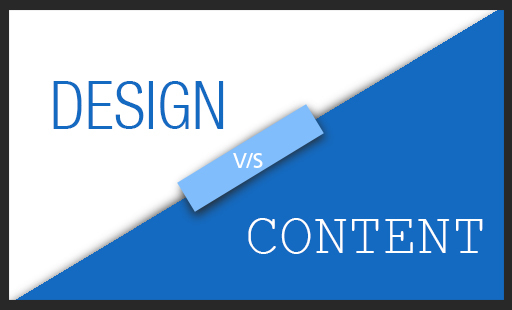 The real test of whether the project team is on the same page is when the design versus content debate has to be addressed. There comes a point where the designer requires the content to start working on the design concepts and most of the time he will get a response along the lines of “I can’t write the content until I know how the page will look, and how much space is available for the text”. This discussion could go on forever just like the chicken/egg debate. The design purists will tell you there is no way they can convey a message visually, if they hardly know what the message is. On the other hand, the content curators will argue that now that User Experience (UX) has become so crucial – due to multiple platforms and devices – it makes sense to design a layout that will engage with the audience first and then complement it with relevant text made-to-measure to fit in the available space. One thing is for sure, neither of these methods work on their own. My approach to this dilemma is to use “a little bit of both” through a clear 3-step process that should help the client to understand the workflow without getting too caught up in the details. Explain the web development process to the client in simple terms . Create a flow diagram that highlights the stages and important milestones, which is also useful to refer back to down the track. Information Architecture (IA) is a central part of the web design process. This is where important decisions are made on the different layouts, user interface, user experience, path-to-action, imagery, navigation structure, hierarchy patterns and textual vs visual content balance. The output of effective IA sessions should be clear wireframes which will serve as a blueprint for both visual and textual content creation. Now that the website’s blueprint has been drawn and agreed upon, there is little or no room for content vs. design arguments. If executed correctly, the IA sessions should provide sufficient material for the designer and content creator to start working independently on the main pages and templates. At this stage, the project team will make a series of final decisions on aspects like the look and feel, UI, UX , visual and textual elements. I have found this 3-step approach to work quite well with different clients. The main idea is to ensure that everyone is on the same page as early as possible to avoid unnecessary headaches and delays. And the answer to that is a combination of good project management skills and spending the right amount of time on the Information Architecture. If you have any questions or would like more information, please feel free to leave a comment or to contact me.